Home Technology What Is Wi-Fi and How It Works WiFi? What Is Wi-Fi and How It Works WiFi? What is Wi-Fi and how it works WiFi? Has wireless fidelity refers to wireless networks 802.11 standards developed by the IEEE - WiFi. WiFi or Wi-Fi is a trademark of the Wi-Fi Alliance. 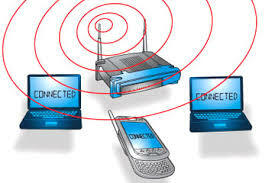 Wi-Fi Alliance testing devices of different Wi-Fi vendors and is a certification. If the product without Wi-Fi Certified WLAN is a guarantee that acts according to the 802.11 standard. There is also a widely used name for the Wi-Fi network and that is wireless. WLAN - Wireless LAN or Wireless LAN is a local network based on Wi-Fi technology Now, if you now what Wi-Fi, so clients can find out how WiFi works ..
802.11a operates in the 5 GHz frequency. Most wireless signals that uses the 2.4 GHz band, so it's not much more likely to reduce the signal strength, because the interference run with other signals on the same frequency. Speed ​​is used in this standard is 54 Mbps and is almost five times higher than the standard speed 802.11b. 802.11b operating at a frequency of 2.4 GHz and a maximum speed of 11 Mbps. The range indoors is about 35 meters (117 feet) and 100 meters (333 feet) in the outdoor environment. 802.11g operates at a frequency of 2.4 GHz, with a maximum speed of 54 Mbps. Hardware is compatible with 802.11b hardware. What's 802.11n Wi-Fi? Most manufacturers use 2.4 GHz. The unit working on 802.11n, is compatible with the old standards. The rate is usually 150Mbps, but some wireless router can also operate at 300 Mbps. What is a WiFi device? As mentioned here already, Wi-Fi uses the wireless standard for communication between the wireless access points or routers without broadband cable and wireless clients or computers with the wireless internet card. WLAN uses nine WLAN services for packet transfer and management operations. Wi-Fi technology uses training WLAN and WLAN infrastructure. Without broadband wireless router is a wireless access point, which has routing capabilities and broadband connection has. Broadband connection is provided by fiber optic, DSL, Ethernet or cable modem. Each wireless broadband router is a wireless access point (wireless devices, such as computers and PDA-s is connected to a wired network) with broadband access and a router (a device that route packets between computer networks) simultaneously. What is a Wi-Fi card? It connects devices to the wireless LAN or WiFi network. On the web you will find the alternative card WiFi name and a wireless card. Wireless cards support one or more standards 802.11a, 802.11b, 802.11g or 802.11n Wi-Fi.